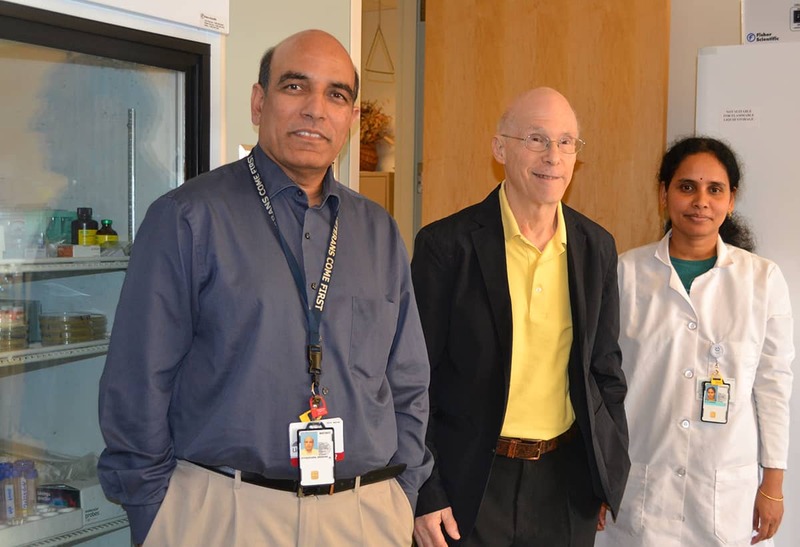 Srinivas Ayyadevara, left, Robert Shmookler Reis and research associate Ramani Alla stop for a photo in their UAMS Donald W. Reynolds Institute lab. Nov. 15, 2018 | A team of University of Arkansas for Medical Sciences (UAMS) research scientists recently was awarded a $1.8 million, five-year grant by the National Institute on Aging to investigate common pathways that contribute to the aging of various tissues. Robert Shmookler Reis, D. Phil, professor in the UAMS College of Medicine’s Donald W. Reynolds Department of Geriatrics, and Srinivas Ayyadevara, associate professor in same department, are the co-principal investigators leading the study. Co-investigators are Steve Barger, Ph.D., professor in the Departments of Geriatrics and Neurobiology & Developmental Sciences, and Alan Tackett, professor in the Department of Biochemistry & Molecular Biology. The goal of the research is to identify what different neurodegenerative diseases like Alzheimer’s disease have in common with other age-progressive diseases and conditions such as heart disease, muscle wasting, kidney disease, and type 2 diabetes. Protein aggregation — clustering or clumping of protein molecules — has long been recognized as a hallmark of neurodegenerative diseases like Alzheimer’s and Parkinson’s. Reis said the team has looked at protein aggregation for nearly a decade, funded by grants from the U.S. Department of Veteran Affairs. For the last two years, it has also been supported as part of a multi-investigator National Institutes of Health (NIH) grant led by Sue Griffin, Ph.D., professor and vice chair of research at the UAMS Donald W. Reynolds Institute on Aging. Peter Crooks, Ph.D., D.Sc., chair and professor of the Department of Pharmaceutical Sciences in the UAMS College of Pharmacy, developed novel derivatives of anti-inflammatory drugs. As part of the NIH grant, Crooks, Reis, Ayyadevara, and graduate student Samuel Kakraba tested these drugs for their ability to inhibit protein aggregation and to extend life. One drug, PNR502, was the main subject of a recently awarded patent covering several bioactive compounds.